Blend of sophistication and elegance. Belle Maison Hadana Resort & Spa Hoi An managed by H&K Hospitality is idyllically located between Cua Dai Beach and Hoian Ancient Town. 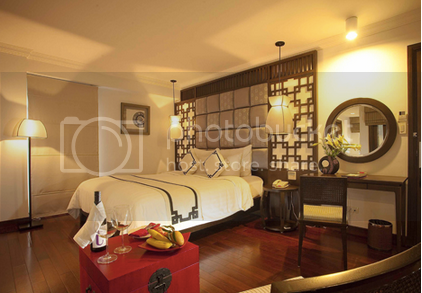 The property is stylistically designed to be harmony between Hoian's heritage significance and touch of modernity. 95 guestrooms at Belle Maison Hadana Resort and Spa Hoi An come with private balconies overlooking the well-tended garden, green paddy fields and outdoor swimming pool. A business centre and tour desk, gift shop, hair salon and sauna, airport transfer, a fitness centre, a spa and hot tub are also available. Located on Nguyen Van Thoai street, just few minutes on foot from the beach, Royal Lotus Hotel Danang offers an international service with 192 rooms. This 4-star hotel, the flagship of H&K Hospitality, includes huge conference halls for above 1000 people with state of the art facilities, 1 restaurant serving local and international cuisine, a sky bar with spectacular city and ocean views; fitness center and spa with outdoor swimming pool which will bring more exciting experiences to the guest. The hotel is ideally poised to accommodate business and leisure travelers alike. Royal Lotus Ha Long Resort & Villas inspires a new lifestyle that combines luxurious living, utmost comfort and a great harmony with nature. All 110 modern villas feature three spacious double bedrooms, two cozy twin bedrooms, a fully-equipped kitchen and living room; creating a perfect sense of “home-away-from-home”. The resort provides world-class entertainment and relaxation facilities: All-day restaurant, bars, fitness & spa, indoor heated pool, outdoor pool, garden and private beach; making it an excellent option for a dream-like holiday in Ha Long. Royal Lotus Hotel Halong offers an International standard of Vietnamese hospitality service with 147 rooms ranging from Premium, Deluxe and Suite. The perfect location to stay in the Bai Chay area with a beautiful view of Halong Bay. This luxurious hotel provides extensive amenities including; an indoor Swimming Pool, fine dining at Vietnamese, Japanese and other top quality International restaurants, Wellness Spa, Gym, Convention Rooms and a roof top bar and a piano lounge. Dream Hotel & Apartment locates right in the center of Dong Da district, at the main intersection of O Cho Dua – Xa Dan Road with Nguyen Luong Bang Road, which is the main traffic route connecting to the downtown Hanoi. The building is just a few steps away from major companies, business centers, government offices, shopping malls. Dream Aparthotel is such a convenient base from which to explore the city and its attractions. A renowned 5 star hotel property in picturesque coastal Central Vietnam, CenDeluxe Hotel Tuy Hoa boasts of 218 well-appointed Guest Rooms and Suites; sophisticated interiors of the Hotel is designed by a French Interior Architect and it provides a distinguishable ambience to the entire property. This luxury hotel in Phu Yen has one entertainment lounge with a stunning panorama of Tuy Hoa City as well as four dining outlets where our guests can enjoy a wide variety of Asian, International and Vietnamese Culinary Gourmet Masterpieces prepared to perfection by our skilled Executive Chef and his team of Gastronomic specialists. Conifer Boutique Hotel pays homage to a bygone colonial era, situated in the heart of the historic city. The hotel nestles in close proximity to Hoan Kiem Lake, The Old Quarter and the business district making Conifer Hotel ideally suited for business and leisure guests. Located in centre of the capital, both Maison D’Hanoi Hotels are stylish business hotels that reflect a typical old quarter Hanoi building which is a long and developed on a narrow plot of land. Here, the designers have optimized a narrow Old Quarter lot and created a building that suits the area’s mood and history.